This infographic, highlighting quirks of the UK voting system, recently popped up in my Twitter feed. Whilst the accompanying article makes some valid points, the graphic is rather inaccurate. 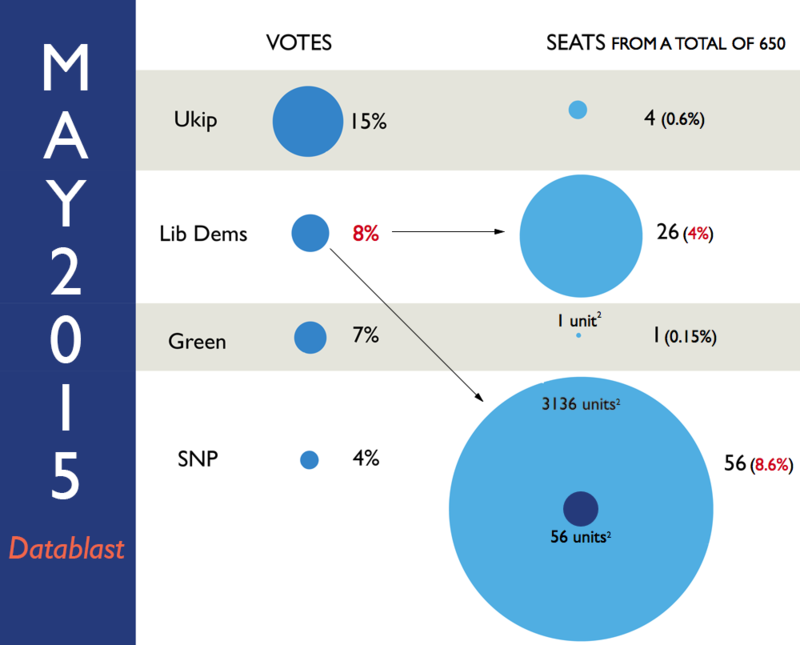 Data Visualisation taken from May2015: Would you like 5 million votes and 4 seats, or 1 million votes and 56 seats? There are considerable ambiguities in how people perceive a two-dimensional surface and then convert that perception into a one-dimensional number. Changes in physical area on the surface of a graphic do not reliably produce appropriately proportional changes in perceived areas. In this instance, the designer has varied the radius/diameter of the circles, which results in a surface area that exaggerates the data. For example, compare the circles for the Green Party and the SNP. If the Green Party circle represents 1 unit-squared, then you’d expect the SNP’s circle to be 56 units-squared. Instead, it is 3136 units-squared—56-times greater than it should be. Secondly, it encourages comparisons between values on different scales: percentage of votes, and number of seats. The graphic gives the impression that the Lib Dems gain considerably from the voting system: 8% votes → 26 seats. 26 seats actually represents just 4% of the total seats (650), so their votes are effectively halved! 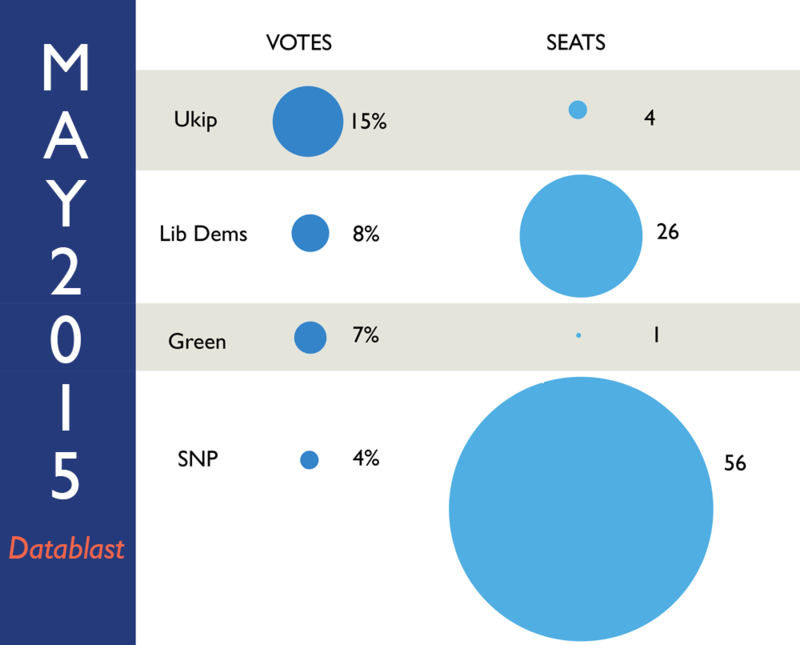 This distortion is also observed when comparing the Lib Dems’ “votes” circle to the SNP’s “seats” circle. The SNP’s 56 seats (8.61%) should be comparable to the Lib Dems votes (8%). It isn’t. Annotated graphic highlighting distortions. The dark blue circle shows how big the SNP’s circle would be if areas were proportionate. What’s more, there is a second graphic (not re-published here), making the same votes-to-seats comparisons but with the Labour, Conservative, and Ukip parties. However, this is on a different scale to the previous one, making any further comparisons impossible. It would be more accurate to make comparisons based on percentages of seats, and include all the data in a single graphic. Perhaps a simple table would suffice? The following table attempts to convey how much each party is set to gain/lose because of the voting system based on the forecast. A ratio greater than 1 indicates that a party gains from the system; ratio less than 1 indicates that a party loses from the system. Ratios can be transformed into “Advantages” by taking logarithms: positive values indicate gain, negative values indicate loss.